Occasionally an endodontically treated tooth may not completely heal after the initial treatment or may develop new problems. 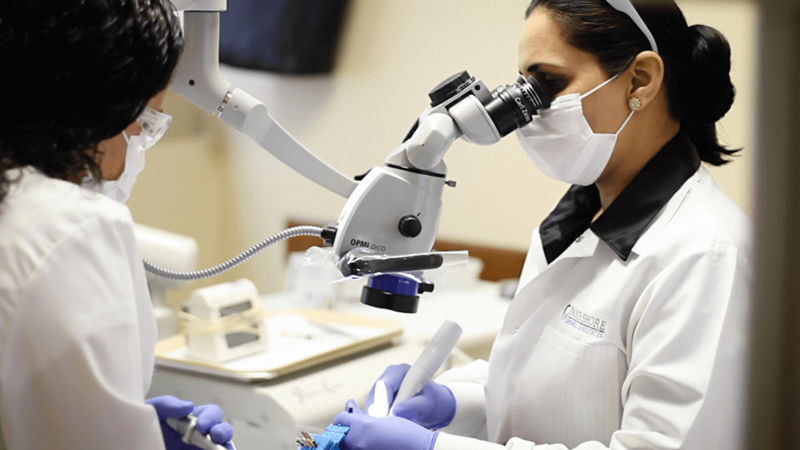 Our doctors can diagnose potential causes of post-endodontic disease and save such teeth by re-treating the root canal space and finding and eliminating the problem. Technology and our clinical experience can give your tooth a “second chance” thereby avoiding extraction. At North Shore & Brookline Endodontic, we take the time to thoroughly assess the risk factors in every case. When needed, we use 3D imaging CBCT scans to evaluate and determine the best treatment option for your specific case. If re-treatment is recommended, we will reopen your tooth to expose the previously placed root canal filling material. This is done by making an opening through your permanent restoration. Additionally, it may be required to remove a post or core build-up. After removing the canal fillings, the endodontist will examine the tooth for a fracture or un-treated canals. Once the canals have been cleaned and re-sterilized, we will re-seal the canals with a new root filling material. Permanent restoration by your general dentist is required after endodontic re-treatment. We will continue to monitor the healing of your tooth. On some occasions, we may need to perform an additional procedure called an Apicoectomy. Pre-operative and post-operative instructions for endodontic re-treatment can be accessed by clicking in the imbedded link. For more information regarding endodontic re-treatment, please visit the American Association of Endodontists.